A major downside of joint bank accounts is that problems can arise in the marriage if you and your spouse do not agree on how the money in those accounts should be spent. If you and your spouse have different spending habits, for example, you are more frugal with your spending while your spouse is an impulse shopper, a shared account can be a source of stress in your relationship. When all your accounts are joined, you will be able to see all your spouse’s spending habits and vice versa. Each spouse may feel the need to question the other’s purchases which may end up causing tension and arguments. If one spouse is entering the marriage with financial obligations that have no bearing on your relationship, it could be problematic if you are spending from joint accounts. It is not ideal if student loans, personal credit card bills, spousal or child support, and any other individual debt comes from pooled resources. If one spouse did not come into the marriage with any debt, they may resent the other if they too are now responsible for the other’s financial obligations. No one enters a marriage thinking it will end in divorce. However, with over 40% of Canadian marriages ending in divorce, one must consider the possibility. If all your money is in joint accounts and your marriage ends in a divorce, it can be a challenge when the time comes to separate your finances. It will be especially difficult if it is not an amicable divorce. Your spouse could even withdraw all the funds from your shared accounts and close them without your consent leaving you with nothing. To prevent yourself from ending in a vulnerable position, keep separate accounts. Having separate bank accounts does not mean that you won’t need to discuss money with your spouse. Even if you have separate accounts, you must set financial goals together. Furthermore, there are certain expenses that must be shared when married. If you and your spouse have separate accounts, you should have one joint account in which you each deposit a portion of your income that will be put towards shared expenses such as bills, mortgage and your children’s education expenses. This way you will have the best of both worlds—the independence of personal accounts and the convenience of joint accounts. Looking for a family lawyer in Toronto to help you settle your marriage finances with your spouse? If you and your spouse are having trouble deciding on how your marriage finances will be handled, you may want to see a family lawyer to help you create a marriage contract. A marriage contract is a legal document that outlines how you and your spouse will deal with the issues in your marriages, including finances. When there is a clear agreement on how your finances will be handled, it is less likely for money matters to cause problems in your marriage. A marriage contract may also outline what will happen in the event you and your spouse choose to get a divorce and could help you to avoid a lengthy battle to separate your money. 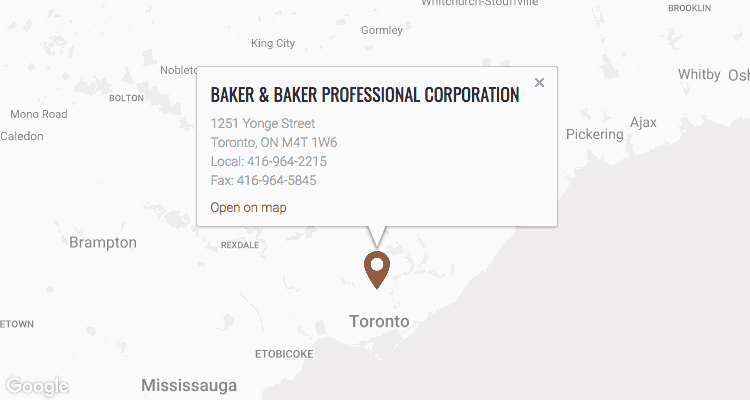 If you are searching for a family lawyer in Toronto to help you create a marriage contract, give us a call at Baker and Baker Family Law. With over 90 years of combined experience, our family lawyers are well-equipped to help you figure out your marriage finances and other important matters. So, contact us today to book a free consultation with one of our Toronto Family Lawyers.